Temple Israel was organized in 60 days back in 1941 just before World War II. And what a feat it was! From our initial meeting to the first High Holiday services led by founder Rabbi Leon Fram just two months later, approximately 600 members chose to join our new congregation. 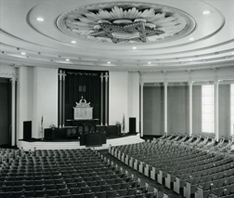 For nearly a decade, Temple Israel met in the auditorium of the Detroit Institute of Arts. In 1950, our first Sanctuary opened in the Palmer Park area of Detroit and remained our home for 30 years. Cantor Tullman was our first cantor until his death in 1960. Rabbi M. Robert Syme joined the Temple in 1953 to help meet the demands of the steadily growing congregation. As the area’s Jewish community began moving towards the suburbs, our congregation moved with it. Our current sanctuary on Walnut Lake Road in West Bloomfield was built in 1980 and expanded in 1989. The move to West Bloomfield brought about a lot of growth and positive change. The ECC and Tyner Religious schools were established, and our congregation grew. We introduced new programs, which helped strengthen the bonds of Jewish community building. In 1995, we were the first Reform congregation to open a mikveh. To modernize and address the needs of our ever-growing congregation, we completed additional renovations to our Sanctuary in 2017. We have since added a host of new technological advancements to make Temple easily accessible in the virtual world - including streaming services so members can participate in our services no matter where they are. Our membership is at 3,500 families (over 12,000 members!) and growing, so keeping our Temple running smoothly is a team effort involving a lot of people. Rabbis Harold Loss, Paul Yedwab, Josh Bennett, Marla Hornsten, Jennifer Kaluzny, and Jennifer Lader, Cantor Michael Smolash and Cantor Neil Michaels all remain actively involved in the life of the Temple. Our lay leadership and executive board also play important roles in the continued development and support of Temple Israel. Temple Israel is our home. It’s our community. It's our way of preserving Jewish traditions in a warm, inclusive, loving environment. We are a Reform congregation, believing that we as modern Jews can introduce innovation while preserving tradition, can embrace diversity while asserting commonality, to affirm beliefs without rejecting those who doubt, and to bring life to sacred texts and teachings without sacrificing critical scholarship. We also believe in the sacred work of social justice, and work hard to bring about positive social change through the lens of our Jewish values. We know that by bettering the lives of those around us and the world in which we live, we are 'praying with our feet,' as Rabbi Abraham Joshua Heschel would say. And as the great talmudist Rabbi Solomon Bar Isaac (otherwise known as Rashi) wrote, "The main descendants of the righteous are their good deeds." And that's a big part of our mission at Temple Israel - to bring about positive social change through our Jewish values. Our hope is to continue Temple’s tradition of preserving these cherished values for future generations.